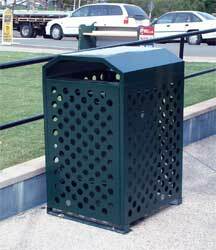 The BIN GUARDIAN provides an attractive dressed up outer cover for standard or compartmented ( for recycling ) 120 or 240 litre Wheely bins. Where large capacity receptacles are required in a public arena that can be serviced by Contractor vehicles, this eliminates the need for heavy lifting by Cleaning Staff. 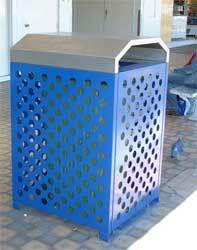 These items are robustly constructed from steel. 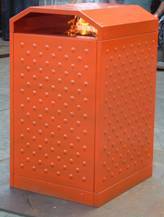 Fire Guardian design contains fires lit by vandals and eliminates all damage to the exterior finish of the Bin Guardian. It retains all debris of the fire inside the bottom of the Guardian for simple and hassle free shovel clean up. 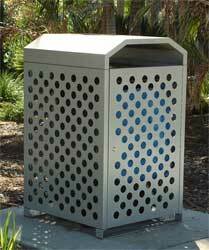 This model is suitable for all areas were vandalism is a given.